A table view displays a list of items in a single column. table view allows users to scroll through the table, although it allows vertical scrolling only. The cells comprising the individual items of the table are table view cell objects; table view uses these objects to draw the visible rows of the table. Cells have content—titles and images—and can have, near the right edge, accessory views. Standard accessory views are disclosure indicators or detail disclosure buttons; the former leads to the next level in a data hierarchy and the latter leads to a detailed view of a selected item. Accessory views can also be framework controls, such as switches and sliders, or can be custom views. Table views can enter an editing mode where users can insert, delete, and reorder rows of the table. Now we will discuss in detail related to properties and actions of the table view. Tapping on table view will open the following window as shown below. 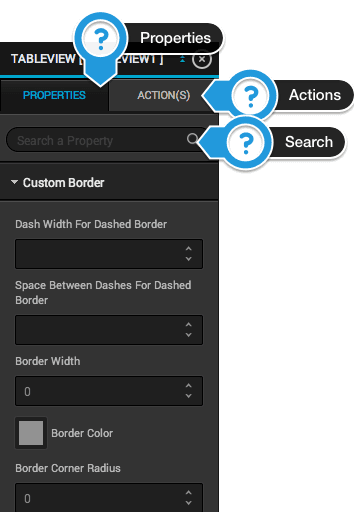 In properties tab you can change any property of table view and even can easily search using the search bar. To configure various events related to view tap on action and configure it. Enable Row Animation :A Boolean value to allow row animation while scrolling. Value - int : The default value for this property is NO. If you change it to YES, row will be animating with animation type “Curl”. Animate To Right : A Boolean value to allow row animation while scrolling from right to left. Value - int : The default value for this property is NO. Animate From Bottom : A Boolean value to allow row animation while scrolling from bottom to top. Animate To Back : A Boolean value to allow row animation while scrolling from right to left. Row Animation Start Position : X Position value from where to start animation. Value - int : The default value for this property is 0. Value : Select any value from the drop down list. Key Name To Sort : Any output key from web service based on which sorting should be done. Value : Select any key from the drop down list. Single Selection View Id : Control object by which single selection should be done. Value : Select any control from the drop down list. Disable Sorting : A Boolean value to disable sorting. Swipe Delete Button Title : Title to be displayed on delete button which comes when swipe on cell. Multiple Selection View Id : A control object for multiple cell selection. Value :Select any control object from drop down list. Sections Enable : A Boolean value to have sectional table. Value :The default value for this property is 0. Section Key : A output key of web service which should be displayed as section title. Value :Select any key from drop down list. Section Header View Id : Section id of header. Section Header Color : set background color of section header. Value :Select color from color wheel pop up. Value :Select image from resources. Section Footer View Id : Set view in table footer. Value :Select a control object from drop down. Sectional Data Is Single Character : A Boolean value to have single character as section title in case of Indexing. Dynamic Height Enable : A Boolean value to have dynamica height of cell. Page Token Id : A output key from Web service for next page data (In case of paging web service). Value :Select key(ex:next_page) from drop down list. Page Load Indicator View Id : A control object id which will visible on page load. Value :Select object Id from drop down list. User Interaction is required for page load : A Boolean value to have “Load more” button at the bottom of table view.To fetch Next page data, click “Load more” button. Value - int : Default value of this property is 0. Allows Selection : A Boolean value to select any row. Allows Selection During Editing : A Boolean value to select any row while table view is in editing mode. Value :Default value of this property is 0. Section Index Minimum Display Row Count : Set number of rows to be displayed in section. Row Height : Set height of cell. Value - int : Default value of this property is 44. Section Header Height : Set height of section header. Value - int : Default value of this property is 22. Section Footer Height : Set height of footer. Scroll Enabled : A Boolean value to enable or disable scrolling. Indicator Style : Set scroll indicator style. Value :Select any style from drop down list. Shows Vertical Scroll Indicator : A Boolean value to set vertical scroll indicator visible or invisible. Value - int : Default value of this property is 1. Always Bounce Vertical : A Boolean value to enable or disable bounce of table view. Background Color : Set background color of table view. Value :Select color from color wheel. User Interaction Enabled : A Boolean value to enable or disable user interaction. Alpha : Set transparency of control object. Its range from 0 to 1. Value - float : Default value of this property is 1. Bounces : A Boolean value to enable or disable bounce. Always Bounce Horizontal : A Boolean value to enable or disable horizontal bounce. Shows horizontal scroll indicator : A Boolean value to set horizontal scroll visible or invisible. Paging Enabled : A Boolean value to enable or disable paging. Style : Set style either Plain or Grouped. Value :Set value from drop down list. Separate Style : Set separate style of cell to differentiate among cells. Separate Color : Set separate color of cell to differentiate among cells. Cell View Id : This is auto generated field of table cell. Section Index Color : In case of paging, set text color of paging characters(A-Z). Section Index Background Color : In case of paging, set background color of paging control. Section Keys : Set output keys from web service, which should be saved when cell will be selected. Set keys by comma separated for multiple keys. Value :Enter output keys from web services. Multiple Selection Session Key : Set session name to be get selected values. As shown in above figure the Tableview’s actions description is given below. Load : The action related to this event will be called when tableview is loaded. 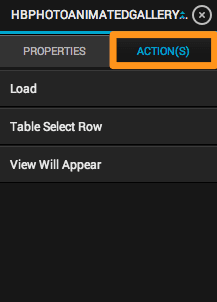 Table Select Row : The action related to this event will be called when user taps on the tableviewcell. Table Swipe Delete : The action related to this event will be called when user taps on swipe delete button. Table Pull to Refresh : The action related to this event will be called when user pull to refresh view. Note : Pull to refresh will be added in the tableview control only when this event is configured. Table Loaded Successfully : The action related to this event will be called when all the data in the cells is loaded completely. Table Swipe Left Animation : The action related to this event will be called when user left swipes the cell. 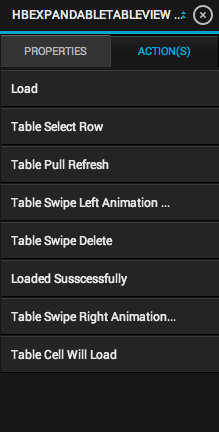 Table Swipe Right Animation : The action related to this event will be called when user right swipes the cell. Table Load Next Page : The action related to this event will be called when user scroll down the tableview. This action is required when you need to provide “Load More” option to the user. Alert Button Click : The action related to this event will be called when user taps on any button of the alert. Table Cell Will Load : The action related to this event will be called when the cell is loaded. This action is required when you need to use option of multiple cells in a single tableview control depending on requirement. Table Cell is the one that appear in Table view objects. This class includes properties and methods for setting and managing cell content and background (including text, images, and custom views), managing the cell selection and highlight state, managing accessory views, and initiating the editing of the cell contents. Now we will discuss in detail related to properties and actions of the TableCell. Tapping on TableCell will open the following window as shown below. Enable Cell Left Swipe Animation : A Boolean value to show customised view in left swipe animation on cell. 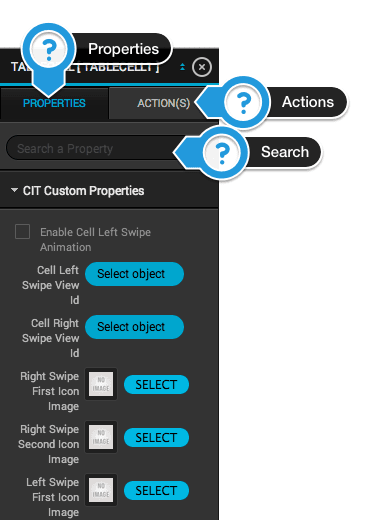 Cell Left Swipe View Id : Control object id to see in cell, while left swipe animation. Value :Select control object id from drop down list. Cell Right Swipe View Id : Control object id to see in cell, while right swipe animation. Right Swipe First Icon Image : Image to be displayed on right swipe animation. Value : Select image from resources. Right Swipe Second Icon Image : Image to be displayed on right swipe animation followed by first icon image. Left Swipe First Icon Image : Image to be displayed on left swipe animation. Left Swipe Second Icon Image : Image to be displayed on left swipe animation followed by first icon image. Right Swipe First Color : color to be displayed on right swipe animation. Value : Select color from color wheel. Right Swipe Second Color : Second color to be displayed on right swipe animation followed by first color. Value : Select color from color wheel..
Left Swipe First Color : color to be displayed on left swipe animation. Left Swipe Second Color : Second color to be displayed on left swipe animation followed by first color. Background View : Set background color of tablecell. Value : Choose color from color wheel. Cell Right Swipe View Id : Set background color of tablecell on selected mode. Dynamic Height Enable in Cell : A Boolean value to enable dynamic height of cell dependant upon content of cell controls. Value : Default value of this property is 0. Value : Select control object id from drop down list. Style : Set style of tablecell. Reuse Identifier : A identifier of cell to reuse in table view. It will reduce memory allocation. Value - String : Enter cell identifier. Selection Style : Set style of cell when tapped. Value : Select style from drop down list. Accessory Type : Set accessory type to cell. Editing Accessory Type : Set accessory type to cell in editing mode. As shown in above figure the Label’s actions are almost similar to View ‘s actions which are discussed Controls - 1 Views and Controls - 2 Buttons . Please refer documents of all the actions . 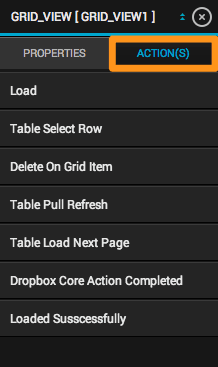 HBExpandable Table View is the custom control by Configure.It. It is used to expand / collapse table view. Show All Opened Sections : A Boolean value to see all sections opens. Initial Open Section Index : Set section number to be expanded(Open) when table view appeared. Value : Select Button object id from table cell. Other properties of this control is same as the Tableview ‘s property. Please refer above. As shown in above figure the ExpandableTableview ’s actions are almost similar to tableview ‘s actions which are discussed above. GridView is the custom control provided by Configure.It. It is used to show data in grid just like collection view. Set padding to give space from Top / Left / Right / Bottom. Space Between Grid Tiles : Set required pace between two grids(tiles). Value - int : Default value of this property is 5. Tile Selected Border Color : Set border color of grid when tapped. Tile Normal Border Color : Set border color of grid. Value - int : Select color from color wheel. Enable Deletion On Long Press : A Boolean value to delete single grid on long press. Enable Deletion Of All Tiles On Long Press : A Boolean value to delete multiple grid on long press. Tile Delete Button Image : An image of delete button. Tile Delete Button X Offset : The offset of deleted button from X position 0. Tile Delete Button Y Offset : The offset of deleted button from Y position 0. Value - int : Default value of this property is -5. Load More View Id : Control Object Id to see as “Load more” in case of paging. Can Cancel Content Touches : A Boolean value to enable / disable touches of content. Delays Content Touches : A Boolean value to provide delay in touches gesture. Directional Lock Enable : A Boolean value to enable / disable scrolling in particular direction. Delete On Grid Item : The action related to this event will be called when the user will click on delete button on the gridview cell. As shown in above figure the Gridview ’s actions are similar to tableview ‘s actions which are discussed above. Please refer above for other actions. A Grid Cell object presents the content for a single data item when that item is within the Grid View’s visible bounds. Other properties of this control is same as the TableviewCell ‘s property. Please refer above. As shown in above figure the GridCell’s actions are almost similar to View ‘s actions which are discussed Controls - 1 Views . Please refer document of all the actions. Animated Photo Gallery is a custom control provided by ConfigureIT. It is used to show views with horizontal scroll with different animations. Below properties are explained in detail in TextView Control. Please refer Controls - 2 Text document. Value - int : The default value is 1 and user can increase and decrease to change slide change time of slide show. Enable Slide Show : A boolean value to enable/disable slide show in animated photo gallery. Value - Bool : Defaultly it will be in disable state.User can change as per requirement. Below property are explained in detail in View Control.Please refer Controls - 1 Views document. Value - String : Value is automatically taken. User will have to change if cell is changed in any case. Value :User can select animation type from following. Space Between Items : Integer value to set space between two items in gallery. Minimum Space Between Items : Integer value to set minimum value between items. Maximum Space Between Items : Integer value to set maximum value between items. Should Repeat Item : A boolean value to enable and disable circular data display. Value - bool : Default value is false. User can change it to provide repetitive circular data.Ex: If records are displayed like 1 to 10 then after 10 navigation won’t stop.It will again start from 1 to 10. As shown in above figure the AnimatedPhoto Gallery ’s actions are almost similar to tableview ‘s actions which are discussed above. A photo gallery cell control presents the content for a single data item when that item is within the photo gallery’s visible bounds. The scrollview provides support for displaying content that is larger than the size of the application’s window. It enables users to scroll within that content by making swiping gestures, and to zoom in and back from portions of the content by making pinching gestures. Scrollview comes with a view with it. Add controls to that view. Zooming View Id : Set control object which should be zoom in / zoom out. Value : Select control object from drop down list. Scroll To Top : A Boolean value that controls whether the scroll-to-top gesture is enabled. Value - int : Default value for this property is 1. Deceleration Rate : A floating-point value that determines the rate of deceleration after the user lifts their finger. Value - float : Default value for this property is 0. Initial Zoom Scale : A floating-point value that determines the control with zoom in / zoom out effect. Value - float : Default value for this property is 1. Indicator Style : The style of the scroll indicators. Default : The default style of scroll indicator, which is black with a white border. This style is good against any content background. Black : A style of indicator which is black and smaller than the default style. This style is good against a white content background. White : A style of indicator is white and smaller than the default style. This style is good against a black content background. Paging Enabled : A Boolean value that determines whether paging is enabled for scrollview. Value - int : Default value for this property is 0. Minimum Zoom Scale : A floating-point value that specifies the minimum scale factor that can be applied to the scroll view's content. Maximum Zoom Scale : A floating-point value that specifies the maximum scale factor that can be applied to the scroll view's content. Can Cancel Touches : A Boolean value that controls whether touches in the content view always lead to tracking. Value - bool : If the value of this property is YES and a view in the content has begun tracking a finger touching it, and if the user drags the finger enough to initiate a scroll, the view receives a message and the scroll view handles the touch as a scroll. If the value of this property is NO, the scroll view does not scroll regardless of finger movement once the content view starts tracking. Delays Cancel Touches : A Boolean value that determines whether the scroll view delays the handling of touch-down gestures. Value - bool : If the value of this property is YES, the scroll view delays handling the touch-down gesture until it can determine if scrolling is the intent. Directional Enabled : A Boolean value that determines whether scrolling is disabled in a particular direction. Value - float : If this property is NO, scrolling is permitted in both horizontal and vertical directions. If this property is YES and the user begins dragging in one general direction (horizontally or vertically), the scroll view disables scrolling in the other direction. If the drag direction is diagonal, then scrolling will not be locked and the user can drag in any direction until the drag completes. The default value is NO. Below properties are explained in detail in View Control. Please refer Controls - 2 Text document. Content Size Width : A integer value that specifies the width of scroll view. It is used when content of scrollview covers more width than application window width. Value - int : Default value for this property is same as scrollview width. Content Size Height : A integer value that specifies the height of scroll view. It is used when content of scrollview covers more height than application window height. Value - int : Default value for this property is same as scrollview height. ContentOffset X : A integer value that specifies X offset of scroll view. ContentOffset Y : A integer value that specifies Y offset of scroll view. Page control used to create and manage page controls. A page control displays a horizontal series of dots, each of which corresponds to a page. Page Control On Image : Set image to be displayed as selected(on) dot of page control. Value - : image Select image from resources. Page Control Off Image : Set image to be displayed as non-selected(Off) dot of page control. Numbers of pages : Set numbers of pages(dots) control can have. Value - int : Default value for this property is 3. Current Page : Set which page(dot) should display as selected. Hides for Single Page : A Boolean to hide page control if there is only page. Value - Boolean : Default value for this property is 0. Defers Current Page Display : A Boolean value that controls when the current page is displayed. Page Control Tint Color : Set tint color of Page Control. Current Page Indicator Tint Color : Set tint color of selected page(dot). As shown in above figure the slider control’s action description is given below. Load The action related to this event will be called when the page control will be loaded in the screen. 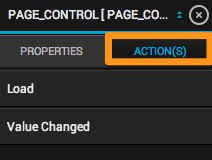 Value Changed The action related to this event will be called when user switch from one page to another in the page control.